Because of the succes of the first four Vista-class ships, Carnival ordered two improved and enlarged versions of the same design for Holland America Line. Also, this design was used for Cunard's Queen Victoria. Although the first ship of this new so-called Signature-class was the largest ship ever ordered for Holland America Line, she wasn't really a revolutionairy ship with exciting new gimmicks, like we have seen aboard other new additions to the cruisefleet. But the new class was a true evolution of the Vista-class sisters, that slowly started to push Holland America Line towards a more modern era. The name of the new Signature-class, by the way, comes from the line's slogan, Signature Of Excellence. In september of 2010, I had the opportunity to see Eurodam in New York, sailing down the Hudson river after she just had departed from her terminal. 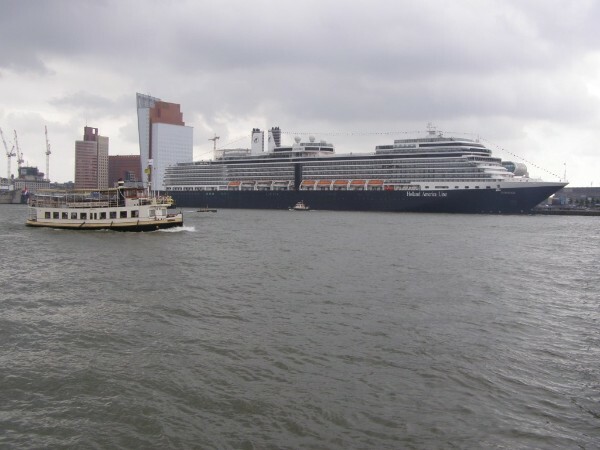 Of course, New York has always been one of the most important ports of the Holland America Line ships, from their early beginnings in 1872 up untill this very day. The first ship of the Signature-class was ordered at the 30th of november of 2006 and her keel was laid on the 9th of february of 2007. She was built under yardnumber 6149 at the Fincantieri Cantieri Navali Italiani yards at Porto Maghera, Italy. With a tonnage measurement of 86.273 she was the largest ship ever for the old company. Her lenght is 285,30 meters, she is 32,20 meters wide and her draught is 7,80 meters. The ship has a total of 13 decks, of which 11 can be used by her passengers. About them, with a total capacity of 2104 she is the first ship in the fleet to cary over 2000 passengers. Those are taken care of by 929 crewmembers. The new ship was driven by two diesel-electric aft-mounted ABB Azipods, propelling her across the oceans with a speed of around 23,9 knots. Her power output comes from six MaK-designed diesel engines, up to a total of 64 kW. Also, three 1,9 mW bowthrusters were installed for better manouverability. There was a little debate going on about the new ships name, as most well-known names that had been used within the company before were already in use at the time when the ship was about to be taken into service. A sale or transfer of one of the smaller ships within the fleet seemed unlikely, so a name that had never been used before was chosen, Eurodam. Immidiately, the joke was that the next ship in the class would become the Dollardam or Yendam, but of course the new ships name had nothing to do with the European coin. The name was chosen to honour the European roots of the company and in that way a fitting name. The second ship in the class, eventually, became the Nieuw Amsterdam and entered service in 2010. Eurodam floated out of her building dock at the 28th of september of 2007 and was finally completed at the 16th of june 2008. Like all other ships within the fleet, the ship is registered at Rotterdam, flying the Dutch flag. Below, Eurodam is shown when she enters the port of Rotterdam backwards at the 29th of june, 2008 for the naming ceremony. The ship is of similar design as the fore-runners in the Vista-class, also topped with two working funnels. 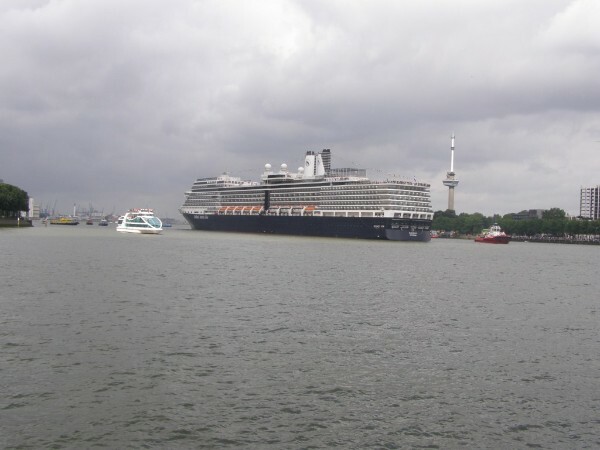 Nice to mention about this maybe is that after the introduction in 2010 of the Nieuw Amsterdam, Holland America Line now has six two-funnelled passengerships in service, the same number as they had in service throughout the 1920's and 1930's. The largest external change is of course the extra deck in contradiction to the Vista's and the aft decks, that were stepped down in the earlier ships of the Vista-class, but sadly brought in line with Eurodam and Nieuw Amsterdam in a later stage. It gives the ships a more 'boxy' exteriour, earning more euro's of course but spoiling their appearance a bit. Of the ships 1022 cabins (63 more then her earlier Vista-class sisters), ten have floor to ceiling and wall-to-wall windows, giving of course spectacular views. Next to that, some 67% of the cabins have balconies and 86% are ocean-view. Cabin, suite and corridor interiours were designed by Seattle-based NB Design Group and are a change from earlier ships with a mono-chromatic design with new colours and wood tones. All cabins are featuring the Mariner's Dream beds, a flat-panel television, DVD-player, a make-up mirror with halo-lighting, massage shower heads, professional hair-dryer and fresh flowers. There are five dining options aboard, including the pan-Asian style Tamarind, the first of its kind aboard a Holland America cruiseliner. Also, there is the Explorers Bar, designed in an African theme. Together with the Manhattan-based restaurant Le Cirque, the Pinnacle Grill is managed and it is the most exclusive place to dine aboard. Nice fact is that the Le Cirque restaurant at East 58th Street in New York was designed by Adam Tihany, who was also asked to design Holland America's 2016-introduced ship Koningsdam. Dutch artist Vincent Jansen produced the artwork for the ship's Atrium and furthermore, reproductions of famous Dutch artworks and paintings are displayed aboard the ship. Eurodam also offers several lounges, like the Silk Den lounge that is based on a Hong Kong hipster's club and the Explorers Lounge, that is a combination between a coffee bar, a library and internet café. One of the most popular venues aboard the ships of the line also came back, the Crows Nest. This lounge overlooks the bows of the ship with a sight of 270 degrees and is a great hangout for late-night entertainment. The BB King Blues Club features the BB King All Stars, a swinging Motown tribute collective from Nashville. Below, Eurodam waits for her godmother at the 1st of july, 2008. Eurodam is the first ship in the fleet that does away with a tenniscourt, instead, the ship offers a combination of a basketball/ dodgeballcourt. Around the main pool, private cabana's are also a new introduction to the line. Aboard Eurodam, Holland America combines its classic style with a more contemparary one, trying to tap into another segment and quietly losing the formal attitude that is so typical for the formerly Dutch company. There still is the two formal nights in the main restaurant and the classic touch of the liners of the past, but Eurodam can also be comfortable for the new breed of passenger, that is not so acustomed to formal etiquetty. On the ship, this all goes well in a nice blend and in doing so, Holland America is slowly attracting a new clientele. With ever growing ships, this is of course a change they simply cannot do without, although I can imagine that the classic Holland America Line customer will rather sail the smaller and older ships of the line. The picture below shows the enormous size of Eurodam, her name still partially hidden, while the crew for the new ship lines up just before naming. At the 1st of july 2008, the ship was named by Her Royal Highness Queen Beatrix of The Netherlands at the historic quayside of the Wilhelminakade in Rotterdam. From this place, the ships of the company had always sailed their transatlantic voyages, after a brief start at another quay in port. Nowadays, the quay is more-over known as the Holland America Quay and streetnames on the pier, that is totally re-develloped into a new part of the city center, are named after important people from the line's history as well as ships the company owned and owns. The former headoffice of the line is still there, in use as a hotel and restaurant, and the departurehall is now in use as the cities cruiseterminal. Recently, Holland America Line also began their European headoffice at the pier, returning to the place where it all started. A fitting place to name a ship dedicated to the European roots of the line. For the ceremony, the Queen was accompanied by Holland America CEO Stein Kruse and the first captain of the ship, Jeroen van Donselaar. The picture below shows Queen Beatrix of the Netherlands next to Stein Kruse, CEO of Holland America Line, just before naming te Eurodam in Rotterdam at the 1st of july 2008. After that, of course the moment when the bottle of fine champagne broke on the bow. After her naming ceremony, the ship departed for Capenhagen, where her first northern European cruise started at the 5th of july. Since her introduction, the ship has mostly sailed northern Europe, the Mediterranean and Canada and New England. In 2010, a sistership was introduced in the Signature-class under the name of Nieuw Amsterdam. Largely the same, she just differs from Eurodam in small things. No more ships of this class will be added, as Holland America still pushed up the scale and introduced the 99.500-ton Koningsdam in 2016 as the follow up, doing away with the two funnels.